Heather Rigby is an Officer at Large and Resident Artist on the executive of Land Over Landings, a grass-roots, non-profit organization whose mission is to convince the Government of Canada to cancel the Pickering airport plan. While half of the original airport site is now within Rouge National Urban Park, the remaining 9,600 acres of prime farmland are still under threat. Land Over Landings is proposing that this land be protected and turned into a food hub of small, productive farms dedicated to training new farmers, conducting agricultural research, and being a secure food source for Toronto and surrounding municipalities. 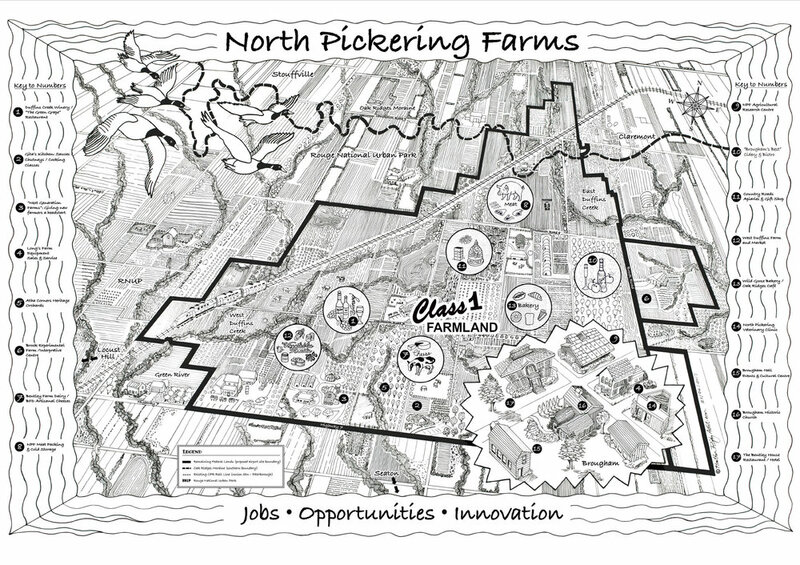 Heather's illustrated map of this proposal brings the vision to life.